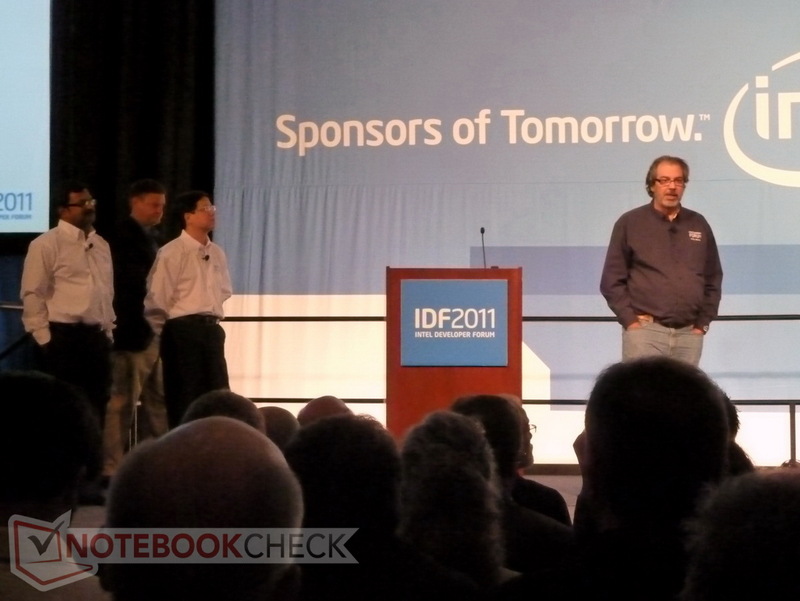 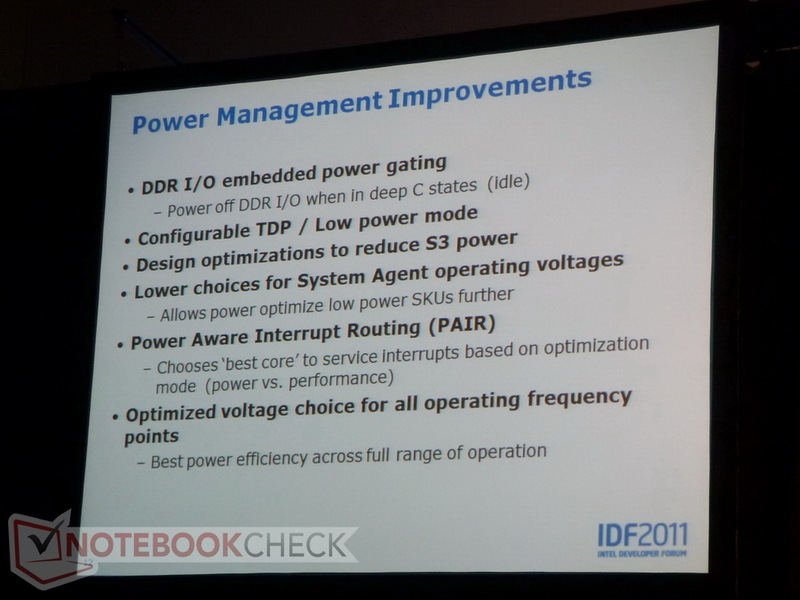 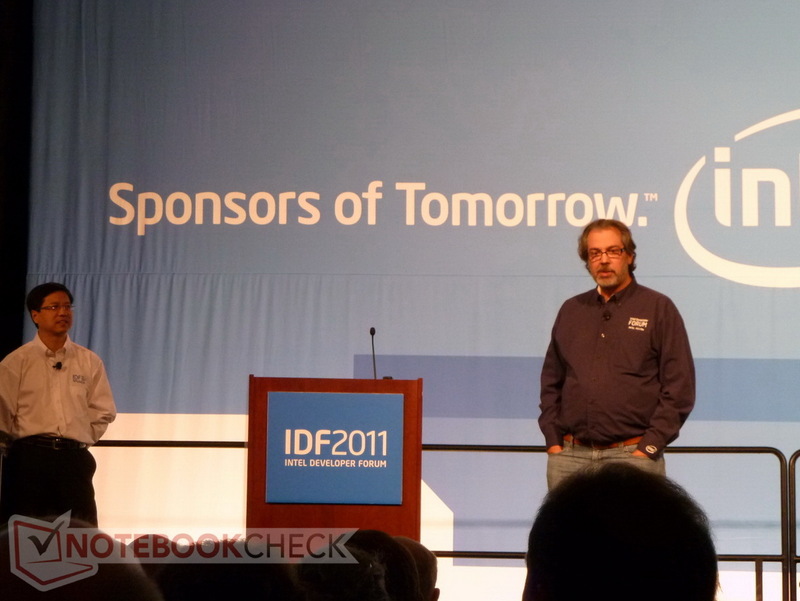 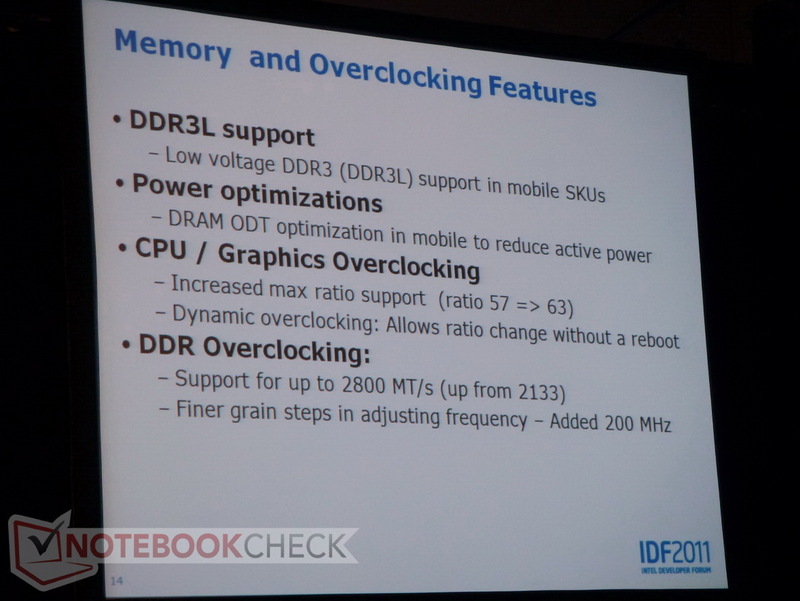 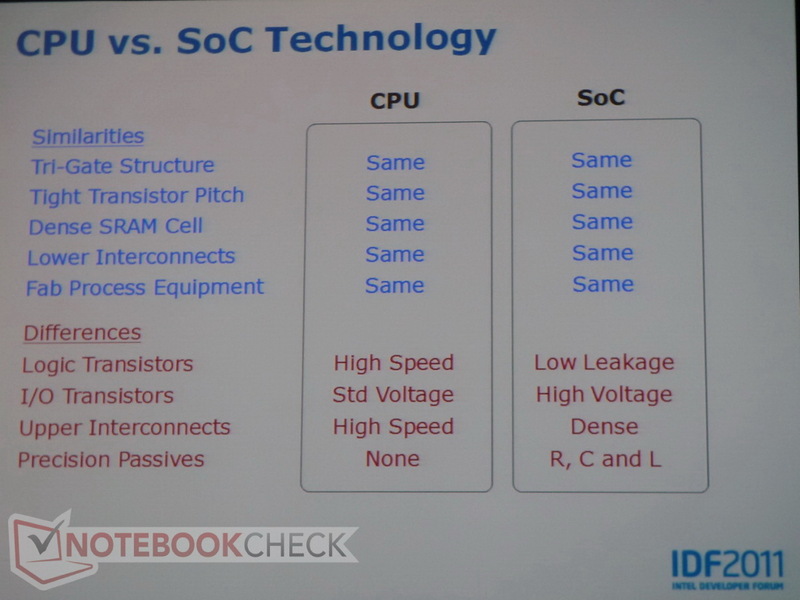 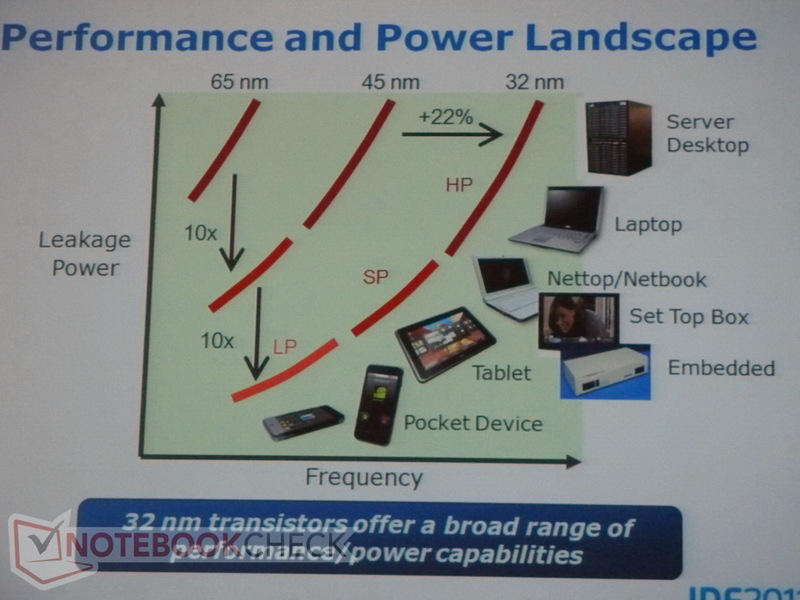 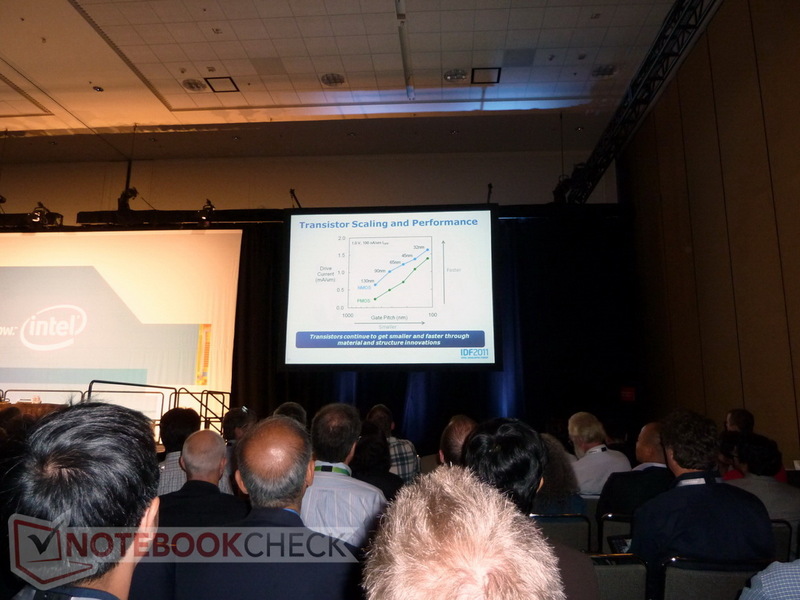 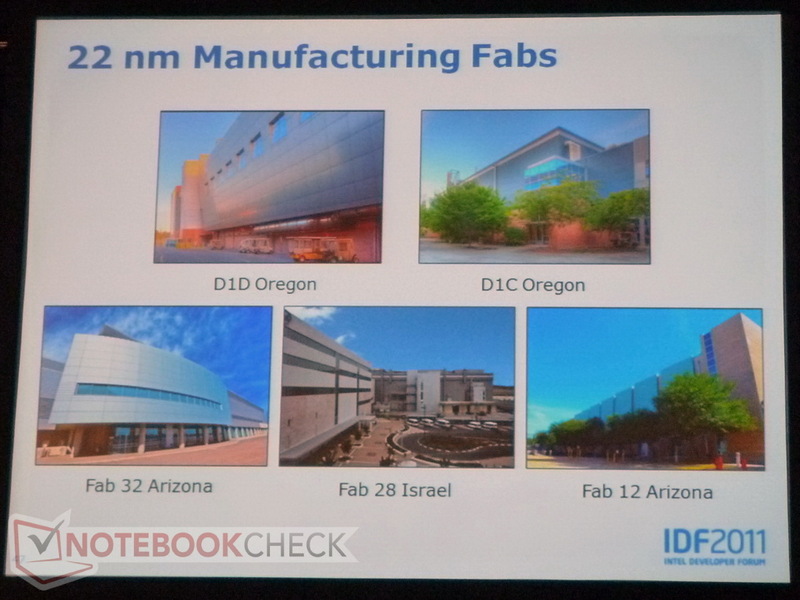 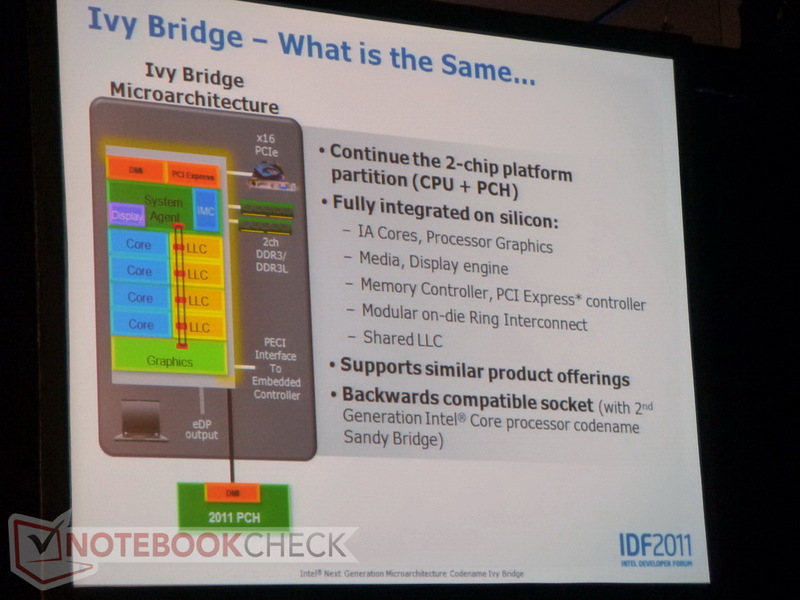 Intel's Developer Forum 2011 has revolved around improvements made to the next generation of processors, and with Notebookcheck live in San Francisco we bring you the most relevant information about the Ivy Bridge architecture. 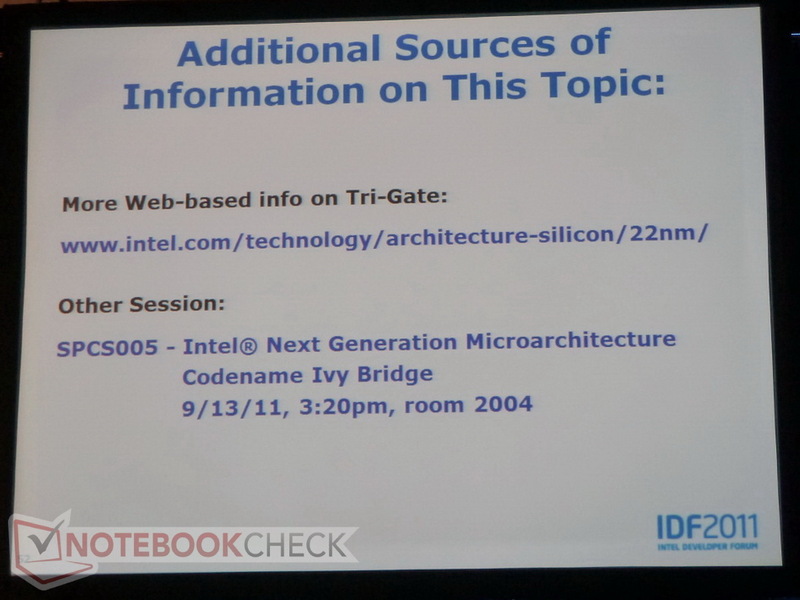 Its been widely known that Intel's next generation processor, codenamed "Ivy Bridge", would be undergoing fundamental changes to its graphics core, and the revolutionary 3D tri-gate transistors that will form the foundation of the 22nm architecture have been widely documented. 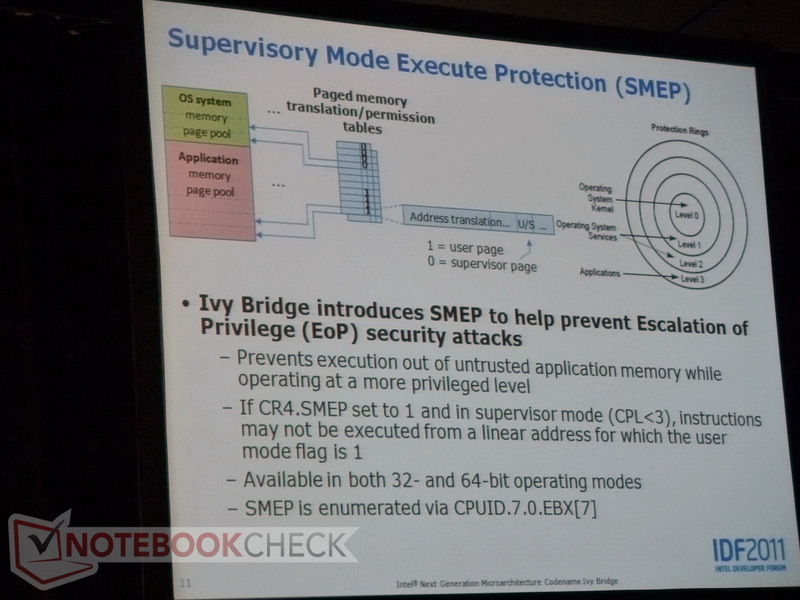 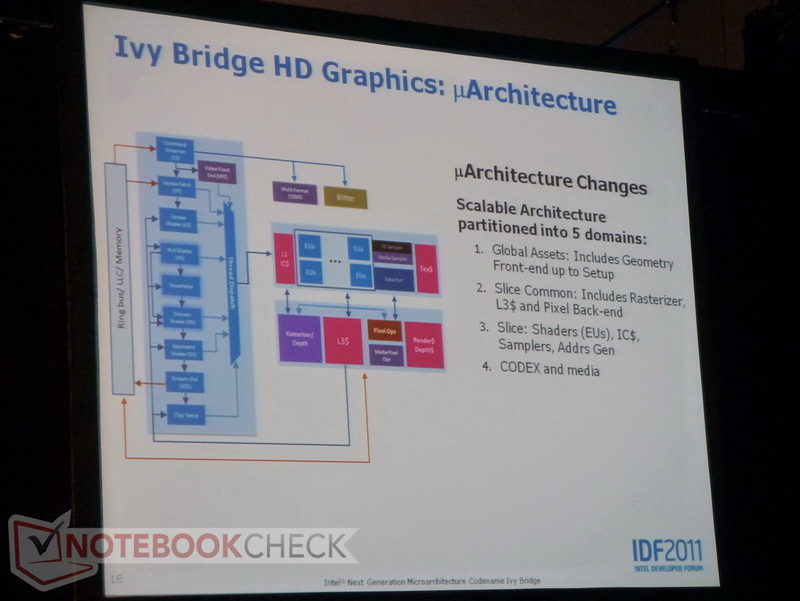 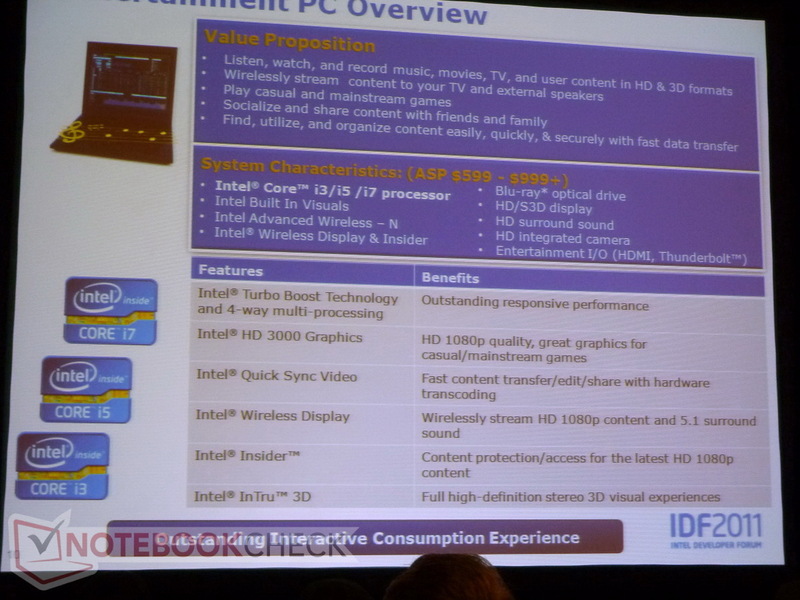 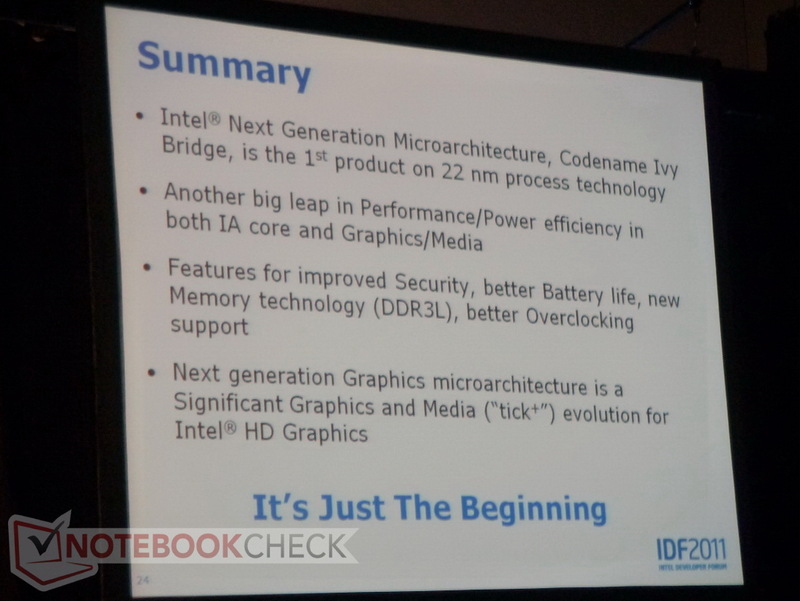 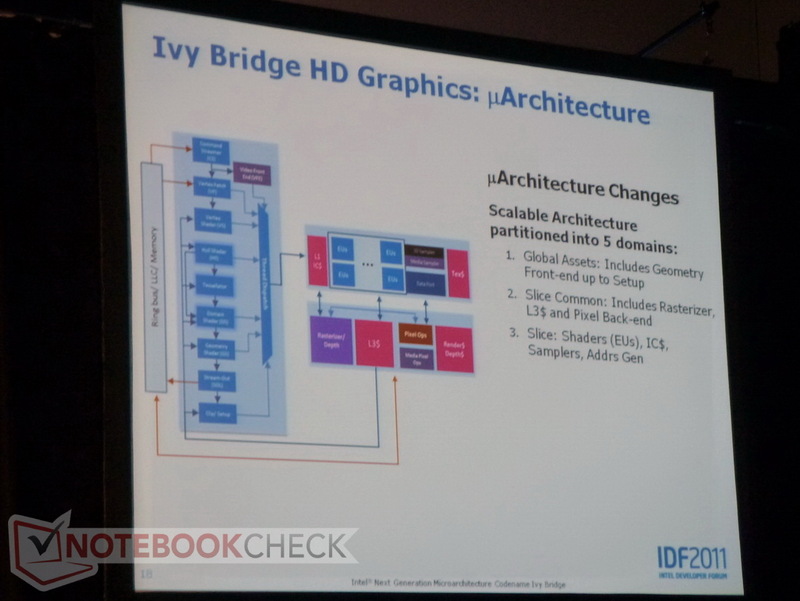 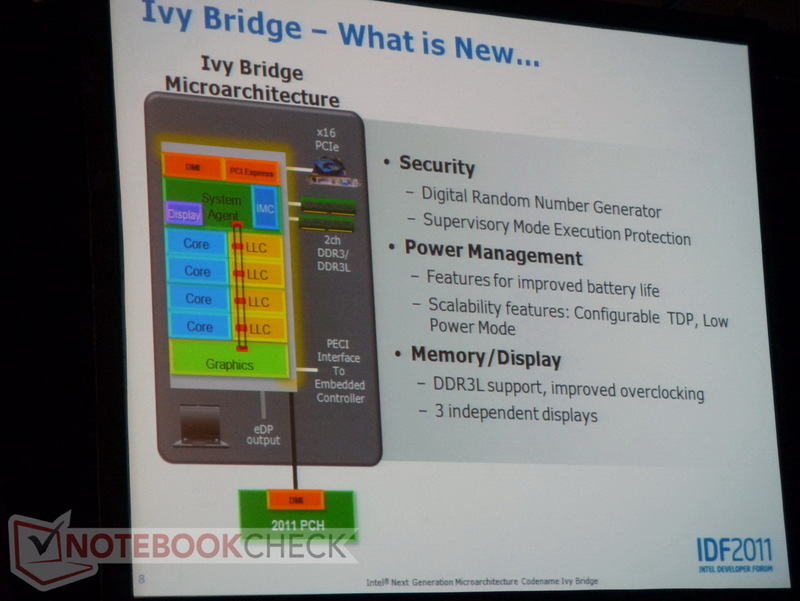 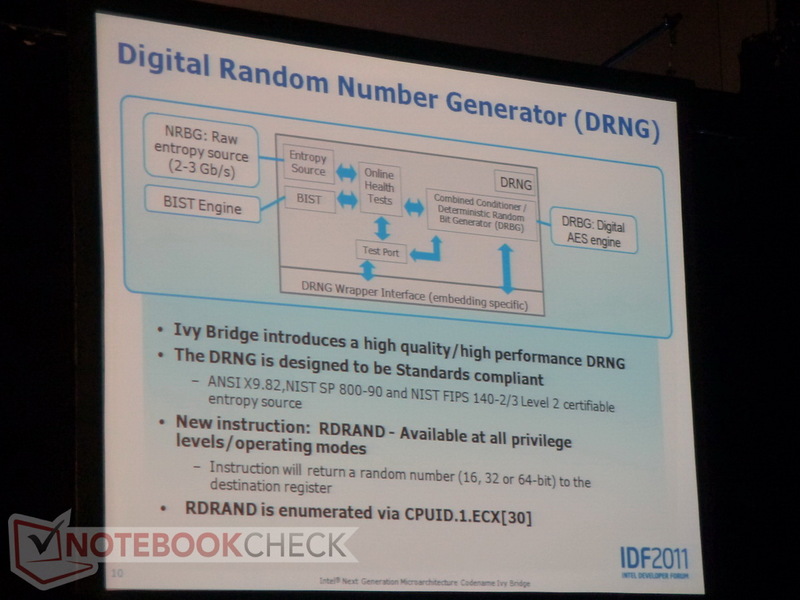 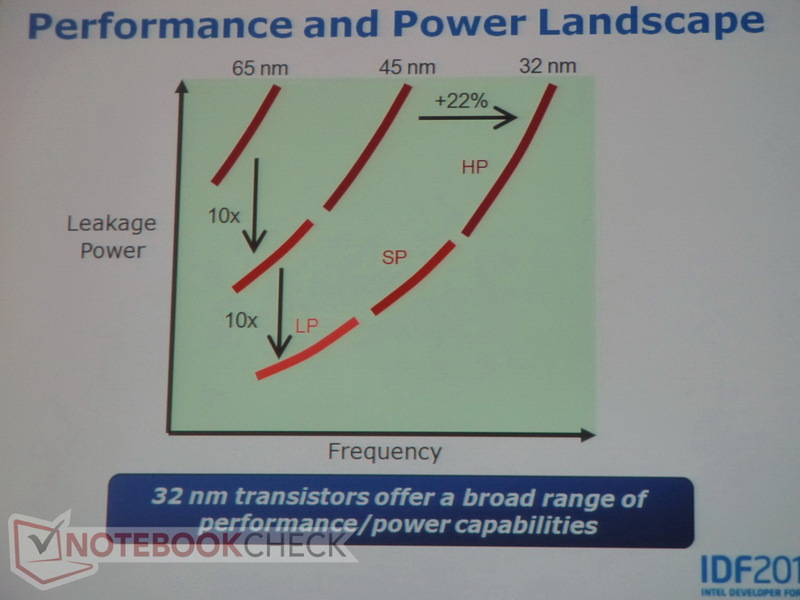 Now live from the IDF event here in San Francisco, we are able to provide more pictures and details about Intel's upcoming Ivy Bridge CPUs, which should be arriving sometime next year. 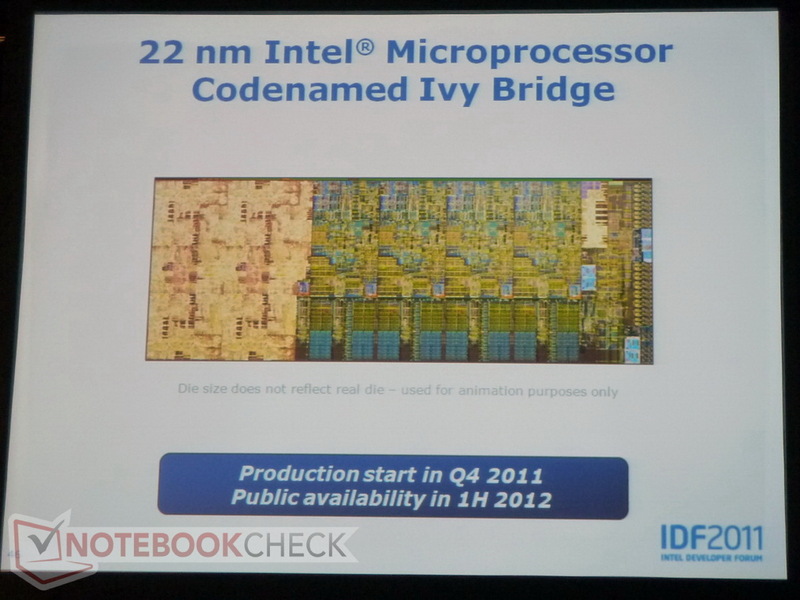 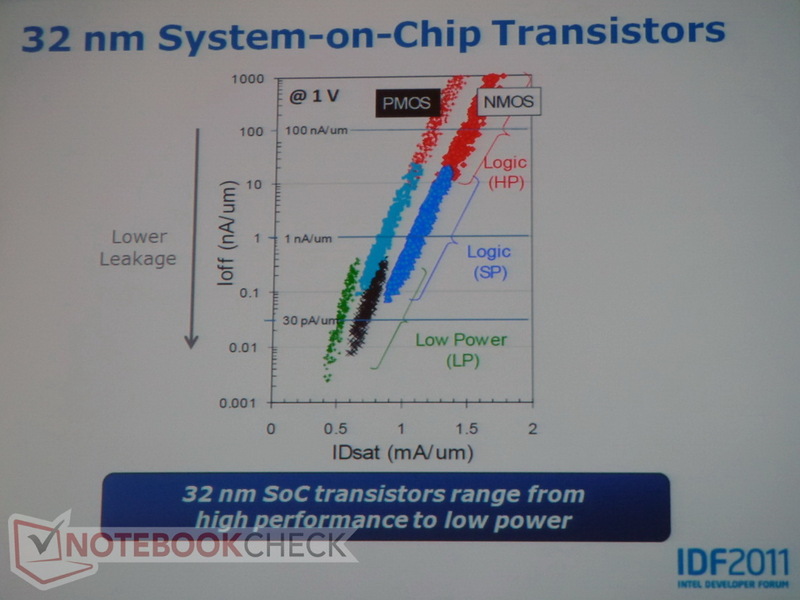 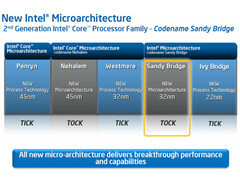 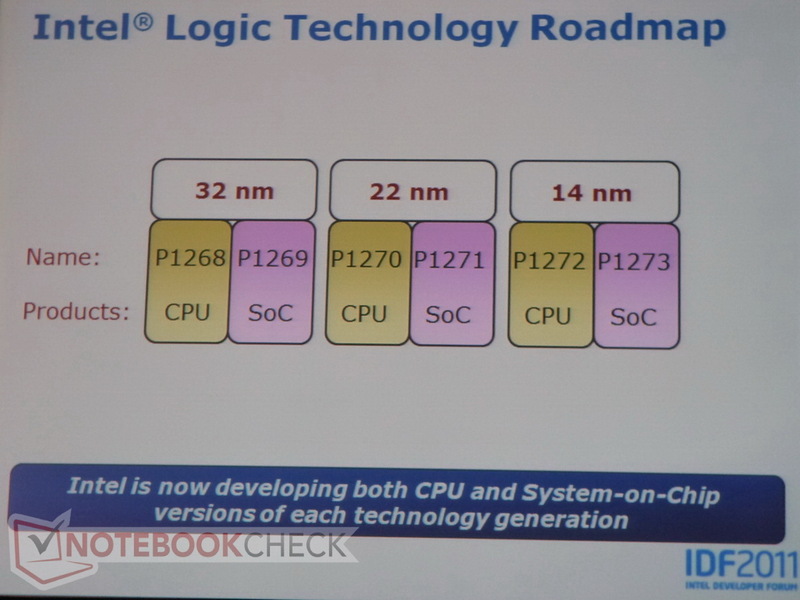 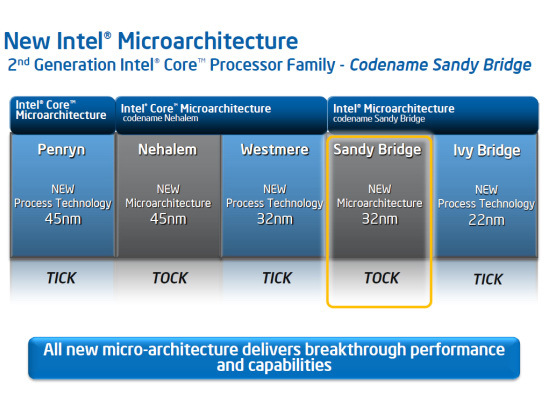 Based on Intel's Tick-Tock Road Map, Ivy Bridge is essentially a "tick" or in other words- a reduction in size that is still based on the current 22nm architecture. 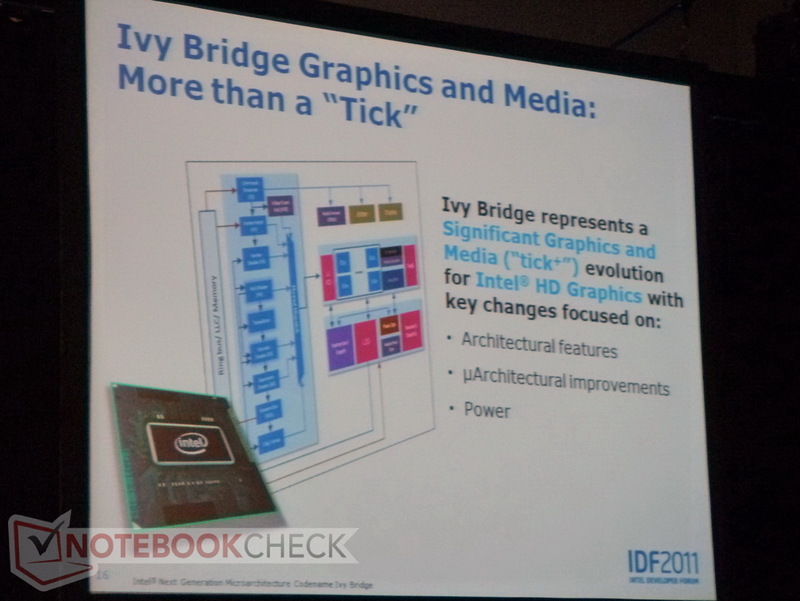 However, the company is changing things up a bit, and Ivy Bridge is referred to as a "tick+" due to the revamped and improved multimedia capabilities and graphics unit present on the chip. 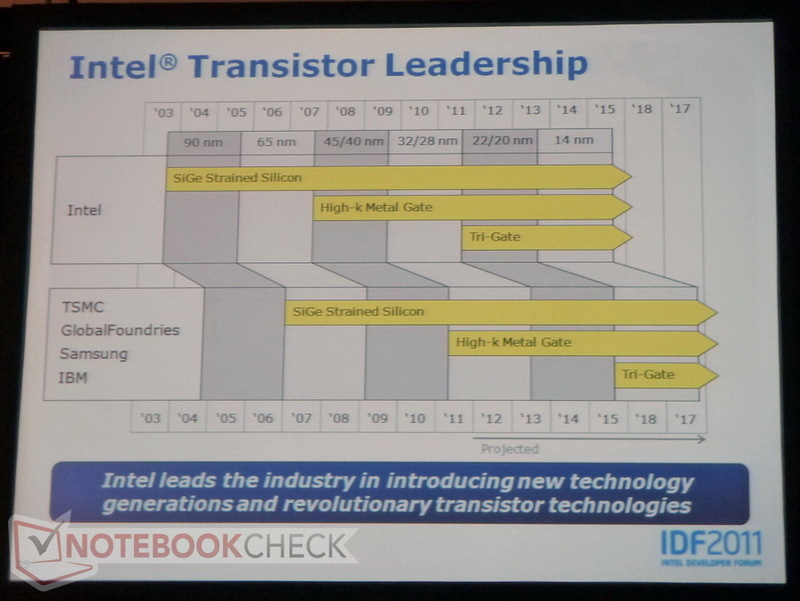 Thanks to further innovations in materials and semiconducter structures, Intel has actually managed to manufacture Ivy Bridge and the 3D tri-gate transistors with significantly less current switching, and as a result the new CPUs are much more economical when it comes to power usage. 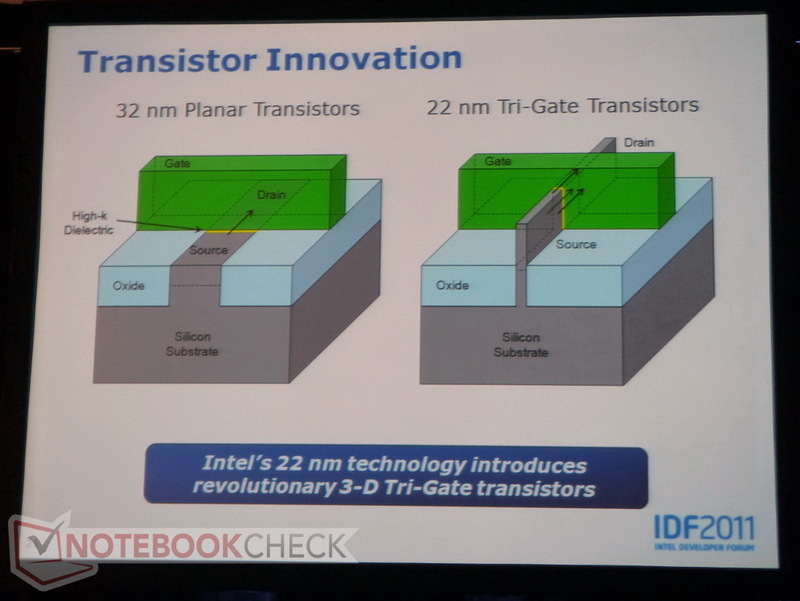 In addition, when compared to the current Sandy Bridge generation, Intel is able to eek out significantly more power, since the 3D tri-gate's faster switching speed offers up to 37% increases in performance. 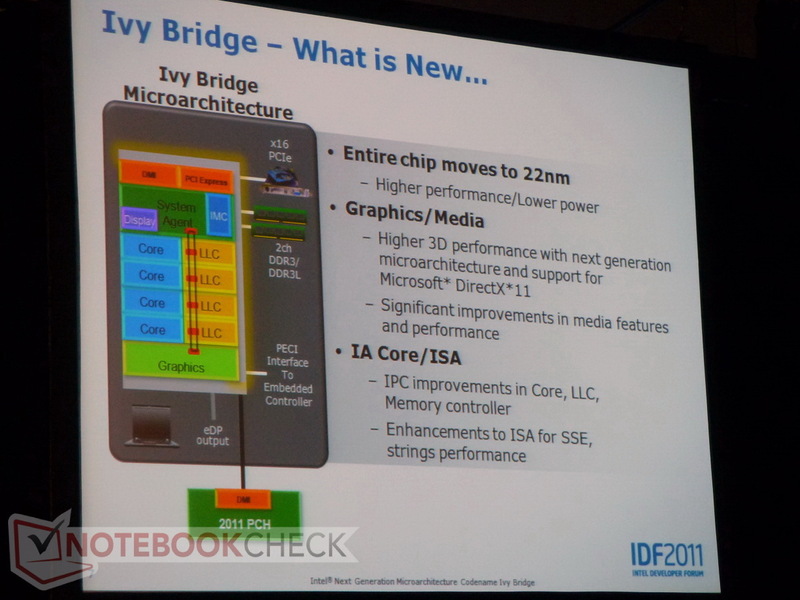 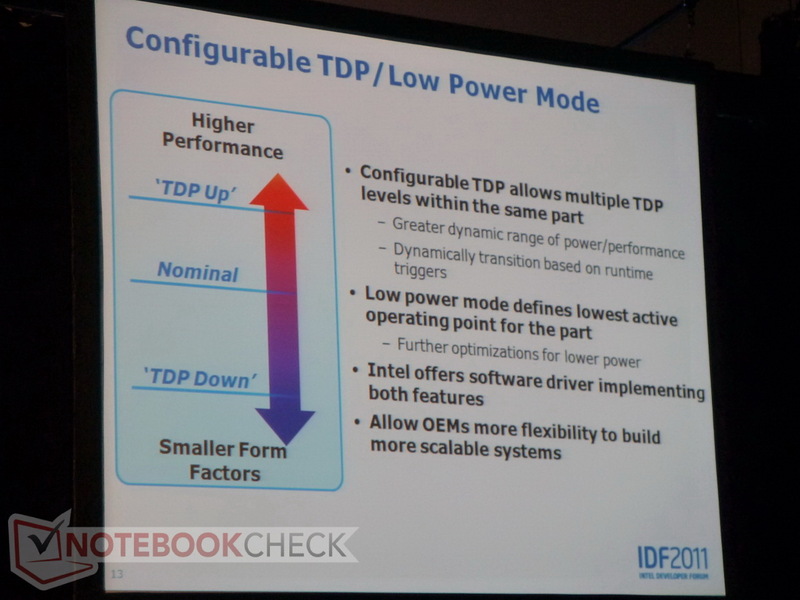 Interestingly, Ivy Bridge also adds a "Configurable TDP" for OEMs, where the TDP (Thermal Design Power) can be manually set depending on usage. As a consequence, notebooks may come with CPUs at lower clock speeds, but less expensive cooling will work to lower prices. 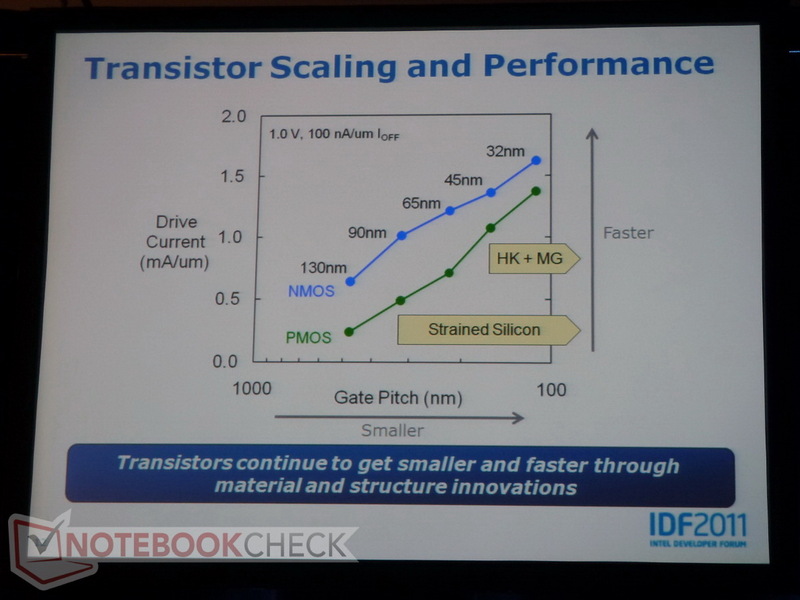 Furthermore, thinner notebooks will be able to generate higher performance as long as adequate cooling is available (a 1.5GHz chip may operate at 2GHz in the presence of a cooling dock). 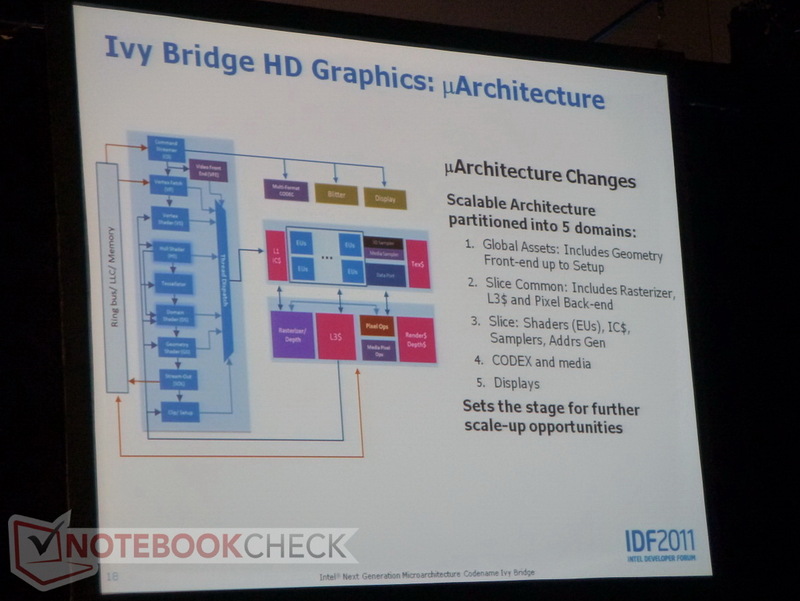 As we mentioned earlier, Intel has completely revised Ivy Bridge's graphics core, and its integrated chip now supports DirectX 11 with hardware tessellation. 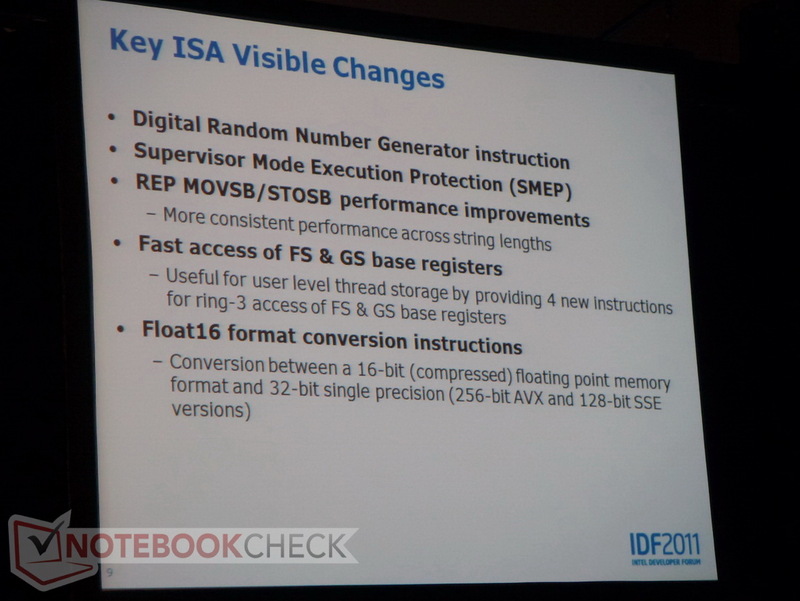 Even then, not only were the number of execution units (shaders) upgraded to 16, but Intel has increased the "Local Shared Memory", which allows for more lively exchanges of data between shaders compared to Sandy Bridge. 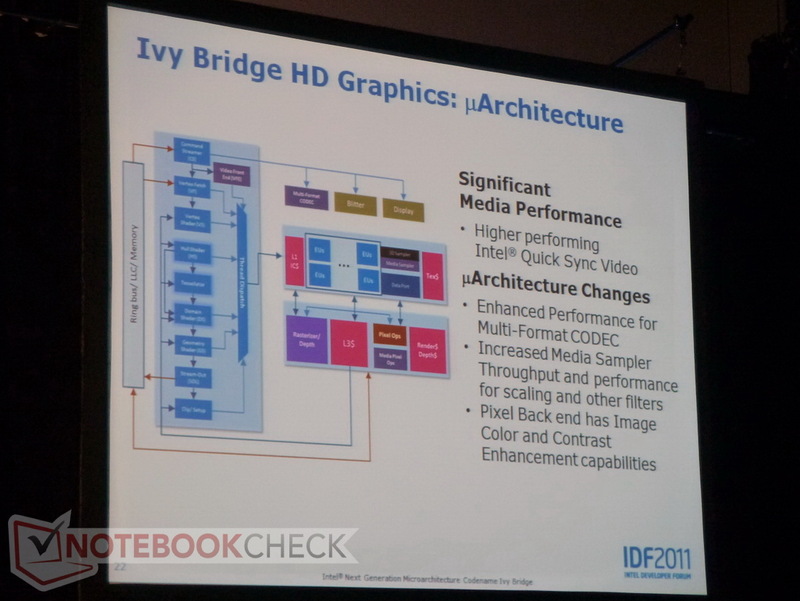 Plus AMD's Llano A8 APUs may not even be able to match Ivy Bridge and its dedicated graphics cache. 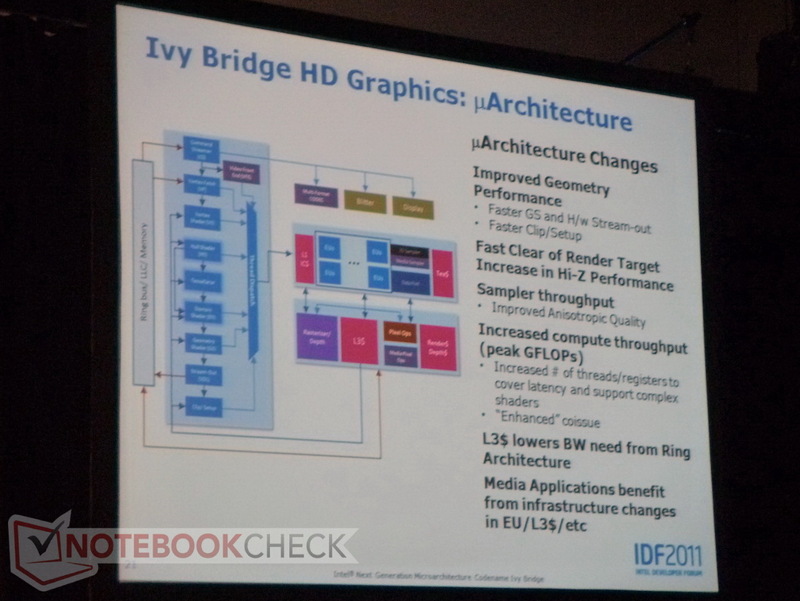 Finally, with further improvements in integrated graphics, Intel is calling for a revision of the Ivy Bridge anisotropic filtering that allows users to improve the quality of surface textures. 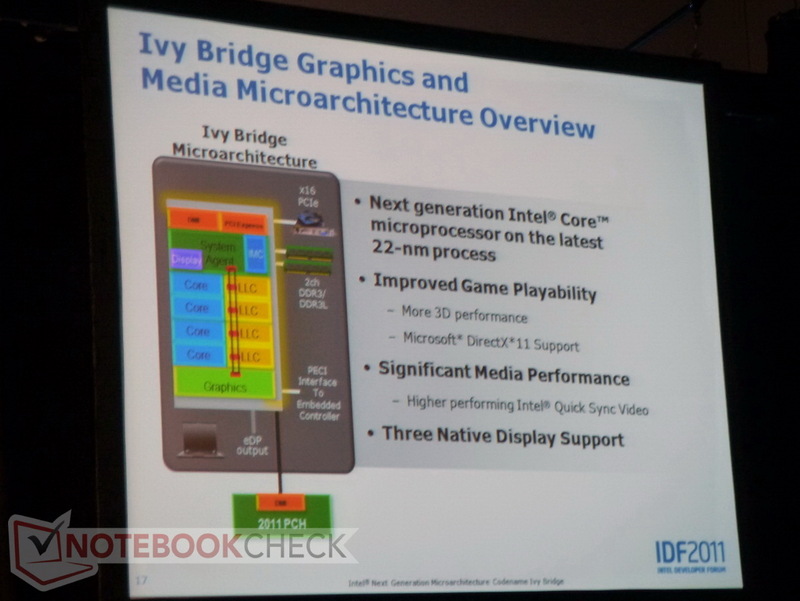 Furthermore, it looks like support of three simultaneous displays will be functional in Ivy Bridge.